NIA CHARLESTOWN NEVIS (March 02, 2018) — A team from the Nevis Literary and Debating Society is ready to defend its championship in the 46th Leeward Islands Debating Competition (LIDC). 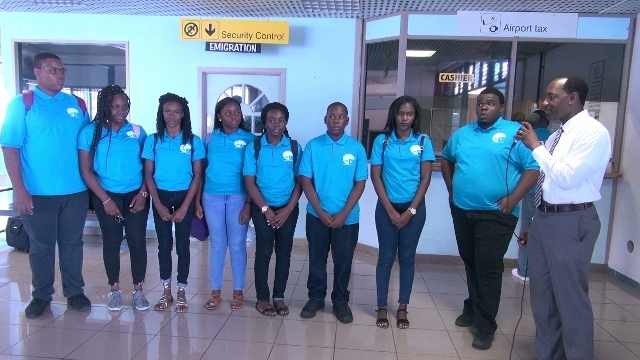 The debaters left the island on February 28, 2018, via the Vance W. Amory International Airport, headed to Anguilla to take part in the sub-regional competition. The LIDC will run from March 2 to 4, 2018. Permanent Secretary in the Ministry of Education Mr. Kevin Barrett wished the Nevis team safe travels and encouraged them to do their best. “On behalf of the Ministry and Department of Education, we would just like wish to our debating team all the best. You did fantastically well last year and I’m hoping that you will do the same thing this year… We are hoping…that you will bring back that coveted trophy. “I want you to concentrate. Do all the preparations that you need to because I know everybody would be targeting for Nevis this year because we are number one. We are hoping that at the end of the debating this weekend that you would all do very well, make yourselves proud, make you families proud, make your school proud and ultimately make Nevis very, very proud of what you would do in Anguilla,” he said. Mr. Barrett also urged the team to have fun, to enjoy Anguilla and to forge friendships with their peers. Last year, Nevis secured three best speaker awards earned by Mr. Rol-J Williams, Ms. Gabriella Brantley and Mr. K-jel Smithen, who was also judged the overall best speaker of the competition. Williams and Smithen are a part of this year’s team, along with Ms. Tassai Pemberton, Mr. Mikkel Maloney, Ms. Delcia Burke and Ms. Lauren Lawrence with two supporters Ms. Chelcia Burke and Ms. Jeriella Liburd. Nevis’ participation in the LIDC was made possible by several partners. The Gold sponsors are the Ministries of Education, Sports et .Al, Nevis Multiline Services, Sugar Industry Diversification Foundation, White Gate Development Corporation, Daniel Brantley & Associates, Food Centre, RBTT Bank, S. L. Horsfords Co. Ltd.. The Gold sponsors are Joseph Rowe and National Caribbean Insurance. The Silver sponsors are the St. Kitts, Nevis Anguilla- National Bank, Nevis Co-operative Credit Union, AMS Trustees (Nevis) Ltd. and Kittitian Food Services. The Bronze sponsors are Liburd & Dash L.P., Bank of Nova Scotia, Morton Robinson, First Caribbean International Bank, The Finished Touch Ltd and Jacinta Wattley-Walters.